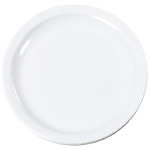 The Carlisle KL20102 Kingline™ sandwich plate is constructed of melamine for durability and resistance to breaking and cracking. While its construction is heavy duty, this dish should not be heated in the microwave or oven. Its narrow rim creates the appearance of more food on the plate. This dish has been temperature insulated to prevent heat or cold from being drawn away from food. The Carlisle KL20102 Kingline sandwich plate comes in white to help product stand out.